This advanced adapter allows Contax Zeiss C/Y lens to fit on Sony E-Mount NEX camera body. It is designed for Sony NEX-3 NEX-3C NEX-3N NEX-5 NEX-5C NEX-5N NEX-5R NEX-5T NEX-6 NEX-7 NEX-F3 NEX-VG10 VG20 A7 A7R A5000 A6000 Cameras and new models. Certain prime lens just can’t be replaced, so you could save the cost of purchase on new lenses with this adapter ring. There are no electrical contacts in the adapter ring. Exposure and focus has to be adjusted manually; Auto focus (AF) is not available. Infinity focus allowed. Top Notch craftsmanship; With precise design and high technology.Made of brass and aluminum (not plastic); Smooth surface for effortless mount; Anodized aluminum construction.Install, remove and operate lens smoothly. Brand of K&F Concept manufactured by a professional team for photography enthusiasts to provide a very exciting experience. 100% Satisfaction Guaranteed. 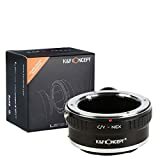 • The K&F Concept C/Y to NEX Lens Camera Mount Adapter allows you to place your favorite Contax / Yashica (c/y or cy) Lens on your Sony DSLR Camera body. Notice: This adapter will NOT fit on the Sony a7S, a7 II, a7S II, and a7R II. NOTE:If your camera indicated “lens is not properly installed”, please modify the camera menu settings. Usually called the”release the shutter the lens is not installed”, you can modify the settings to allow. Specifically refer to the camera manual. This entry was posted in Discount Photography and tagged Adapter, AdapterK&F, Body, Camera, Concept, Contax, DSLR, lens, Mount, Sony, Tripod, Yashica by Ball Photo. Bookmark the permalink.